Orthodontic appliances can be made of metal, ceramic or plastic. They may be removable or they may be brackets bonded to the teeth. By placing a constant, gentle force in a carefully controlled direction, braces slowly move teeth to a corrected position. This is a great time to wear braces! Gone are the days when a metal band with a bracket was placed around each tooth. You can choose the color of the ties that hold the wire in brackets. Wires are also less noticeable than they used to be and the latest materials move teeth faster with less discomfort to patients. Treatment time typically ranges from one to three years, depending on the growth of the patient's mouth, face and the severity of the problem and if doctor and patient decide upon adding accelerated treatment to the treatment plan. 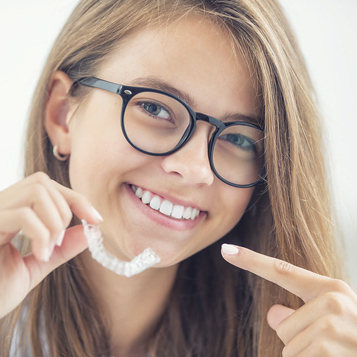 Patients grow at different rates and will respond variously to orthodontic treatment, so the time to case completion may differ from the original estimate. The patient's diligent use of any prescribed rubber bands or headgear is an important factor in achieving the most efficient treatment as is patient cooperation with appointments if Wilkodontics is indicated. Interceptive, or early treatment procedures, may take as few as six months.